I'm not sure what I expected but this is a very nice part of the country. 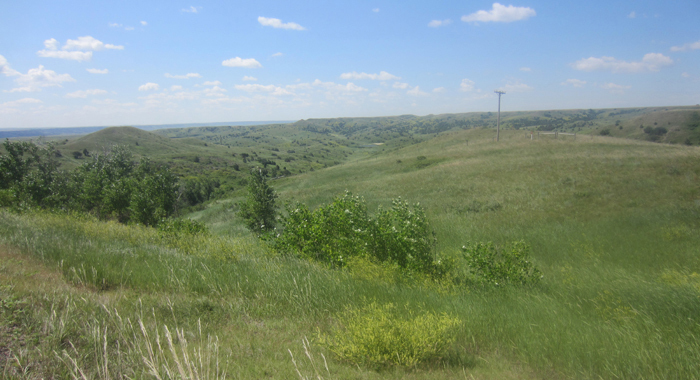 No population but lots of green rolling grasslands and small rock formations. Because of a mixup in hotel accommodations riders stayed in three different hotels in Hot Springs. This meant three different luggage loading times and three different start times. There are many A riders on this trip and Sebastion is out of category. My guess is there are two A+ rides, Ken and Tom. I meet Tom as we slowly follow the many turns on our clue sheet to get out of town. What follows next often happens on a bike tour. Tom and I discuss how difficult tomorrow's ride is going to be and therefore how we intend to take it easy. As soon as we are out of town the road is smooth with great rolling hills for cycling. Soon we are at 24mph charging up and down the hills. Great fun but stupid. I prefer to spend less time at the SAGs then most. I hook up with Dave from CA and we have a spirited, sane ride into Wall. This included 20 miles on I90 but the shoulder was clean and there was not much traffic. It was the first time I have not disliked expressway riding. One of the things I enjoy about tours is what I get to eat. First I stop in the DQ for a chocolate milkshake. From there I go over to the Red Rock Cafe for a very nice steak sandwich. Now that's good eating and not something I do anywhere else. 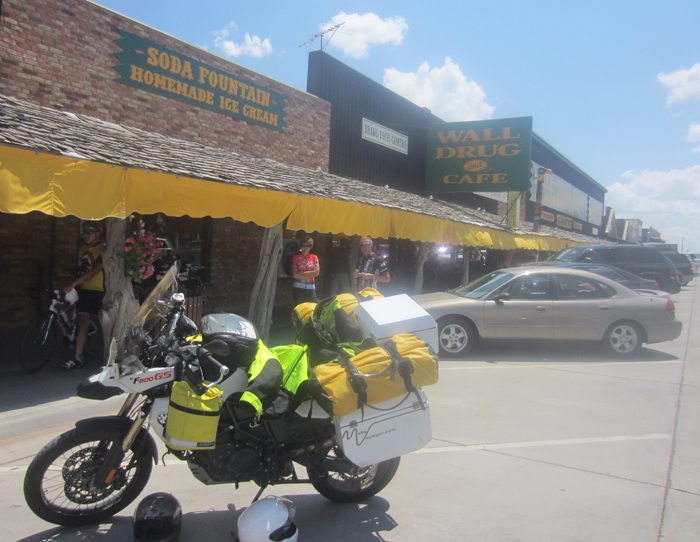 Wall is home to the famous Wall Drug store. I have seen signs every single day I have ridden promoting Wall Drugs. Imagine a large building displaying every single item in the Oriental Trading Post catalog, that is Wall Drug. First thing I do in the morning is look at the weather. It had changed overnight to lots of rain. When I returned from breakfast I realized I was looking at the Ann Arbor forecast. Winding out of town I check the sun and realize the wind will be in our face all day. Tom asks why I think that. Well if the sun rose is the south I would have been correct. I can't imagine why I was thinking the sun comes up in the south. 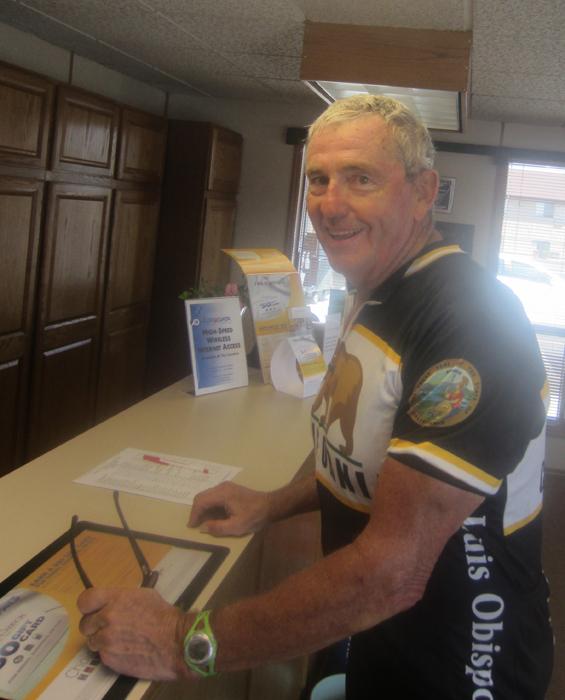 Tomorrow: 117 miles to Pierre into the wind. Intimidating when you are as fatigued as I am. As of the census of 2000, there were 818 people in Wall. As of the census of 2010, there were 766 people. Wall Drug spends 500k a year on billboards. Their revenues are over $10 million per year. There are over 150 minutemen missile silos in this area. Wall Drug store. Famous for roadside billboard promotions and the worst collection of crap at a tourist trap I have ever seen. 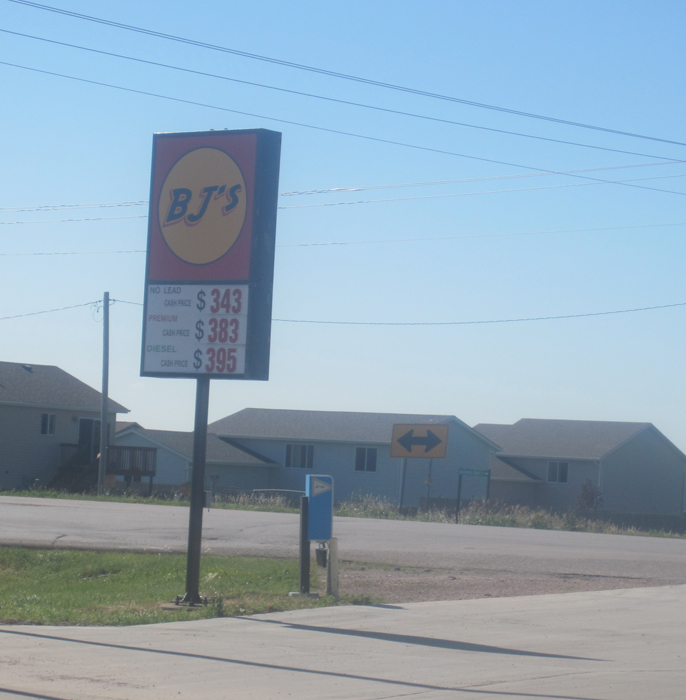 What does this tell you about prices in South Dakota? Uncle Al, ya gotta go for the Grand Slam each day to keep your weight up. There have to be at least 4 ice cream stores on the route each day. I've seen all those places 45 years ago on a road trip with hubby...hope you don't miss the corn palace....quite the sight..you gotta see it too! Enjoying your trip news....Great Going!! Wow, that's sobering about the minutemen...on the other hand, it's nice you are documenting how you're losing it...I find it endearing and humanizing...and just as I was getting so curious about Wall drugstore you included a photo...thumbs up...doesn't get better than guilt free burger and shake...power on! Good Job Al. Keep cool, and best of luck. The sun rises in the South in South Dakota. Who knew? I'm glad you are surrounded by people who will show you the way home. RSRO.